We regularly cue for our round dance club "Bon Temp Rounders" of Baton Rouge, La. on Wednesdays from 6:30pm to 10:00pm. We also cue for the Castoffs Square Dance Club every Thursday. On Select Tuesdays we cue the rounds for the "Flares RD Club" of Houma, La. & "School House Squares" of New Orleans, la. We are in the process of starting an "ADVANCING" RD group that meets once a month in Baton Rouge, La., but are still working on the details. If you are interested, call or contact us. 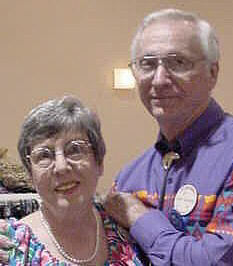 We have been round dancing since 1986 and teaching/cueing for the past 9 years. Our philosophy about dancing is "Make it Fun". Copyright © 2002 Vic Ceder. All Rights Reserved.